45-minute workout that features a series of hills, flats, downhills, sprints, and a light upper body workout all spun out to high energy music. BURN’s cycling room was engineered to ensure there are no bad seats so you’ll always feel connected to the instructor. Step into the ultimate stadium-seated cycle studio and BURN insane calories to a 45-minute workout featuring a series of hills, flats, sprints, race simulations and a light upper body workout – all spun out to high energy music. Screens display real time stats providing instant feedback on your ride (if you opt in). For the competitive and for added fun, the system will even let you compete against other riders. And after each workout, your stats are available via your BURN app or website so you can track all your progress over time and earn monthly BURN Rewards! Full-body, fat-burning, muscle-toning kickboxing workout that blends the use of heavy bags with strikes, kicks, core and interval training. This class is fun, high energy, and combines the benefits of a head-to-toe workout, balance, coordination, and cardiovascular fitness. A 45-minute full-body, fat-burning, muscle-toning workout that blends the use of heavy bags with strikes, kicks, core and interval training. This class is fun, high energy, and combines the benefits of a head-to-toe workout, balance, coordination and cardiovascular fitness. Be sure to try all the instructors, as each brings a unique style and energy that will inspire you to keep on BURNing! Our Yoga and Sculpt classes are for everyone, combining the benefits of instant gratification with long-lasting wellness. 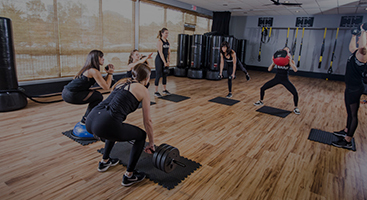 CrossBURN is a unique class to BURN that features a circuit of full body high impact training stations, kickboxing, and core. Performed to timed rounds, this class provide an effective full body cross-training workout that will leave your muscles BURNing in the best way possible! Get the best of both worlds with our 30/30 classes. 30 minutes of high action cycling immediately followed by kickboxing, sculpt or yoga. 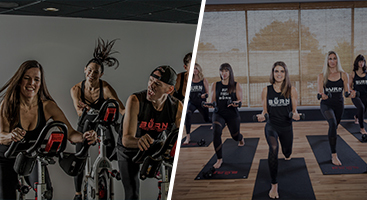 Some of our most popular classes at BURN, you'll feel like a badass every time and go home feeling sweaty, balanced, and accomplished. 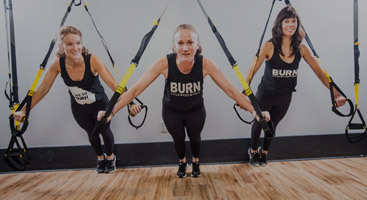 Burn Strength combines multiple rounds of TRX, heavier weights, and plyometrics to strengthen your body from head to toe. With timed rounds, you’ll be experiencing multiple stations concentrating on different muscle groups as well as your core. Get ripped, get strong, get BURNed!